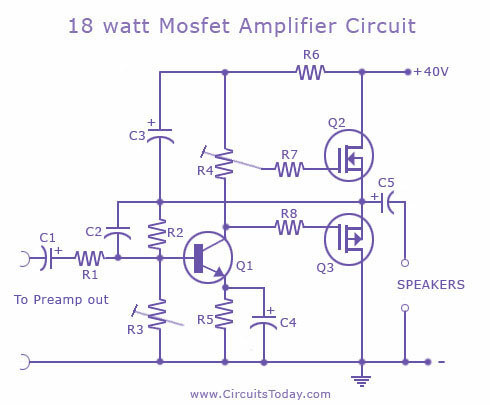 This article lists various types of audio amplifier circuits using Mosfet. We have tested all these circuits in our lab and we found all of them performing satisfactorily. What is a Mosfet Amplifier? Mosfet is a 3 terminal semiconductor device used in a wide range of electronic circuits. It works like a JFET but has less current leakage owing to an oxide insulation between the conductors. Mosfet is a good choice for building linear amplifiers owing to its lesser load, and any amplifier made using it is called a Mosfet amplifier. These amplifiers have a wide range of applications, they can be used in many circuits. Note: This article will be modified with new versions of Mosfet amplifier circuits in future; we shall notify new additions to our home page. This article contains the following list of amplifier circuits using Mosfet. This circuit is an audio amplifier capable of delivering a decent output power with a minimum no: of parts, with considerable sound quality. The amplifier employs only one transistor and twoÂ MOSFETs and few resistors and capacitors in a shunt feedback scheme. This tiny circuit can deliver a whopping 18Watts into 8 Ohm speaker or 30W into a 4 Ohm speaker. To get such a good performance and stability out of few components, a high quality well regulated DC power supply is necessary. This is very essential for reducing noise and getting a constant output power on varying loads. A good DC voltage regulator able to provide more than 2 Amps @ 40V can be used. You can expect such a power supply design very soon here in the power supply section. Assemble the board on a good quality PCB.Use a preamplifier board with tone control prior to this amplifier to get better performance. 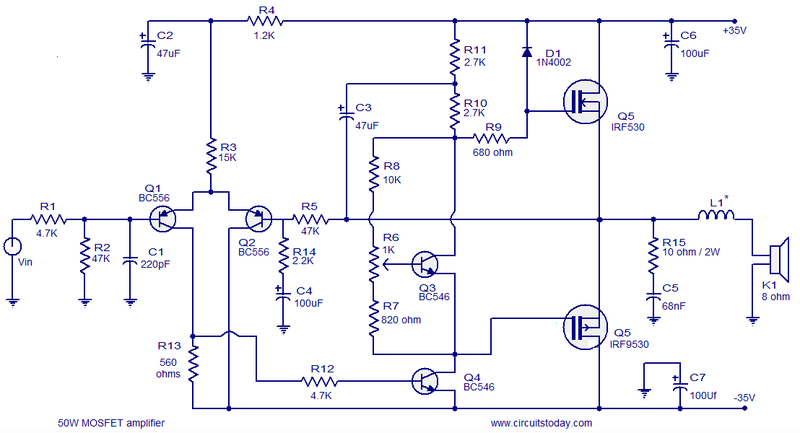 If you don’t want, then no problem because this amplifier circuit has enough punch with in it. 18 Watts Mosfet Amplifier Circuit Diagram. The diagram shown here is of a 10W MOSFET audio amplifier circuit that requires only a single supply. Single rail supply is seldom used in Class-B power amplifiers. Anyway, for low power applications like this, itâ€™s quite fine. Actually, I got this circuit from an old cassette player that is still working and I am publishing it as it is. The powers MOSFETs BD512 and BD522 are obsolete now and so you may use any other matching power MOSFETS instead of them. Transistors Q1 and Q2 are wired as a Darlington pair works as the preamplifier. Preset R3 controls the quiescent current while R2 provides feedback. The output is coupled to a speaker through capacitor C4. Capacitor C5 is the power supply filter and C2 is the input DC decoupling capacitor. Use 30V DC for powering the circuit. Do not expect much performance from this amplifier. Capacitors C3, C4, C5 must be rated 50V and C2 can be 10V. Use a 8 ohm 15W speaker as the load. The first stage of the amplifier is a differential amplifier based on transistors Q1 and Q2. Capacitor C8 is the input DC decoupler, R1 limits input current and capacitor C1 bypasses unwanted high frequencies. The second stage is the driver stage consisting of transistors Q3 and Q4. The output stage is a complementary push-pull stage based on MOSFETs IRF530 and IRF9530. The output is coupled with the speaker using the inductor L1. The network comprising of R15 and C5 is meant for noise reduction. Capacitors C6 and C7 are power supply filters. Preset R6 is meant for adjusting the quiescent current. Use +/-35V DC dual supply for powering the circuit. For L1 make 12turns of enamelled copper wire on a 1cm dia: plastic former. C6 and C7 must be rated 50V; other electrolytic can be 10 or 15V. A heat sink is necessary for the MOSFETs. An 8x4x4 inch finned Aluminum heat sink will do. There is no such thing as a heat sink that is too large. on the 18watt,can bc550 be used? if yes wat would be the changes to b made?thanks. 50w circuit: I tried simulating this circuit on multisim, instead of amplifying the input it attenuates it, what could be the problem ? Hello, would it be okay to use this design for an academic paper? We are doing research for a senior design paper for our undergrad degree in electrical engineering and we need an audio power-amp circuit. Please let us know if this is alright with you. You can use with creative commons rights. Please give us credits. The 50-watt MOSFET amp circuit looks insteresting. It would be a lot more interesting if the input complementary pair were also FETs and the output was expanded to 2 or 3 pairs of MOSFETs to give 100 to 150 watts. Hi Ramesh any transistor is a current amplifier. If current gain of a transistor as per data sheet is say 100 at 1Amp. You require a base emitter current of 10 mA, to have the conduction of 1 amp through collector and emitter. The transistor cannot generate current it can only vary its collector emitter resistance to achieve the required current flow through collector emitter junction as per base emitter current bias. Hi sir!! can i use IRF540,IRF9540 instead of IRF530,IRF9530? thank you! I looked over and over again over the circuit but I cannot find C8. Is it missing or not needed for some reason (maybe the diff amp)? hi, is anybody able to send me a 40W ciruit? Messers! I have A 50 Watt 6 ohm subwoofer with 5 speakers 50 watt 5 ohm each. can you give me’n matching amplifier circuit diagram for my speaker set? How about the quiescent current of 50w power amp? 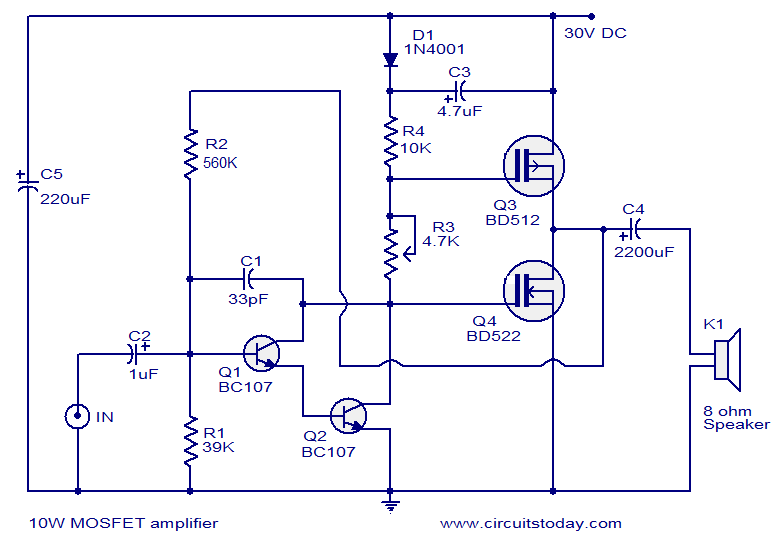 Power up the amplifier without applying an input signal. Let the circuit warm up for about 10 minutes. Measure the current in the positive supply. Can i use it with a microfone with the 2km FM transmitter(http://www.circuitstoday.com/2-km-fm-transmitter)? R3 should be adjusted for 21 volts at the + side of C5, R4 should be slowly adjusted til there is 20 – 50 ma current flow into the drain of Q2 with no input signal. Use at least a 6 sq in heatsink on Q2/3. C5 needs be no more than 35 volts.